Da Capo Press, 9781569246818, 384pp. "Third places," or "great good places," are the many public places where people can gather, put aside the concerns of home and work (their first and second places), and hang out simply for the pleasures of good company and lively conversation. They are the heart of a community's social vitality and the grassroots of a democracy. 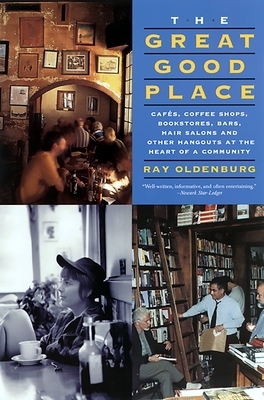 Author Ray Oldenburg portrays, probes, and promotes th4ese great good places--coffee houses, cafes, bookstores, hair salons, bars, bistros, and many others both past and present--and offers a vision for their revitalization. Eloquent and visionary, this is a compelling argument for these settings of informal public life as essential for the health both of our communities and ourselves. And its message is being heard: Today, entrepreneurs from Seattle to Florida are heeding the call of The Great Good Place--opening coffee houses, bookstores, community centers, bars, and other establishments and proudly acknowledging their indebtedness to this book. Ray Oldenburg, PhD, is a professor of sociology at the University of West Florida. He is frequently sought after as a media commentator and consultant to entrepreneurs, community and urban planners, churches, and others seeking to establish great good places. He lives in Pensacola, Florida.